People performed yogic exercises at the Novoslobodskaya Subway Station on the night of November 29, in an effort to strengthen friendly relations between Russia and India. 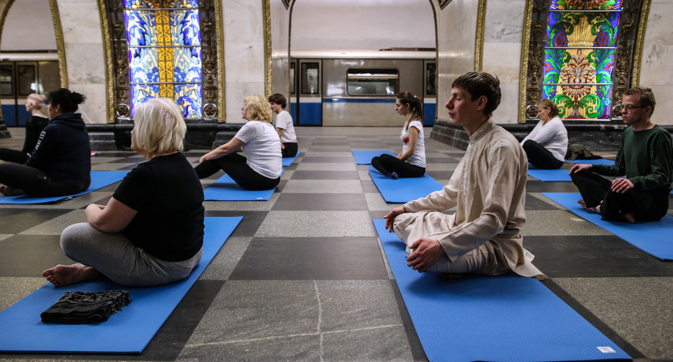 More than 100 people performed a variety of yogic exercises or ‘asanas’ right in the middle of the main hall of the Novoslobodskaya-Koltsevaya Subway Station as part of a “Yoga Night in the Subway” event, held in the Russian capital on Sunday night. The event was organized jointly by the Indian Embassy in Russia and the Moscow Subway. According to those who organized this unique event, the aim was to strengthen the friendly relations between the two countries and to promote a healthy lifestyle which is synonymous with yoga. The opening ceremonies of this holiday were attended by official representatives of the Moscow Subway and the Indian Embassy. Ensembles from the Jawaharlal Nehru Cultural Centre at the Indian Embassy in Russia performed ethnic dances during this event. The high point of the “Night” was the master class on yoga held right on the platform of the Novoslobodskaya Subway Station. Dr. Suresh Babu, who came from India specifically for this event, conducted the master class.